Those of us who can have it, love it, right? I’ve been off all cow-dairy above butter for about 20 years now, and am so thankful that when my stomach is strong enough I can handle it, because it just makes everything taste delicious, and when you’re cutting out this and that, anything naturally delicious is a plus. So, yeah, I’m all about a moderate amount of butter in my diet. But I’m tired of this whole brown butter thing. Yes, browned butter is delicious. Christina Tosi swears by it, so it often makes its way into our Milk Bar Mondays recipes (returning in November! ), like this Cinnamon Bun Pie. I’m guilty of using it specifically in my Maple Ginger Cakes with Brown Butter Caramel and Nutty Gluten-Free Peach Buckle, amongst others. But I’m honestly a little over seeing it in the title of so many recipes nowadays, as if it’s the best thing since sliced bread. Just like brown sugar (which I love!) sometimes masks the cider flavor in your Apple Cider Donuts and you need to revert to white, sometimes browned butter is too strong a flavor for baked goods, and using it isn’t the best choice. Or maybe it is, and I just look at Twitter more than the average person and have developed an obsession and need to step away! But, the result of my cantankerous anti-browned-butter energy expenditure is to feature a butter we don’t name out far often enough: grass-fed butter. Yes, grass-fed butter does more (for me) flavor-wise than any other butter, including ghee (which I go bananas for). Incredibly sweet, a gorgeous golden yellow and exponentially more delicious than regular butter, it makes baked goods just that much better. And it’s got 10 times more Vitamin A and 3 times more Vitamin D than regular butter. No, we’re not looking to get vitamins from our butter, of course. But it just goes to show how much better for you it is. So, moral of the story, maybe take a closer look at the butter you buy as the holiday season approaches. Is it pale white, salty, and sort of watery and bland in flavor? Or is it rich and creamy and so yummy?! Grass fed butter makes me smile. So I used it in this recipe, and smothered it on top. 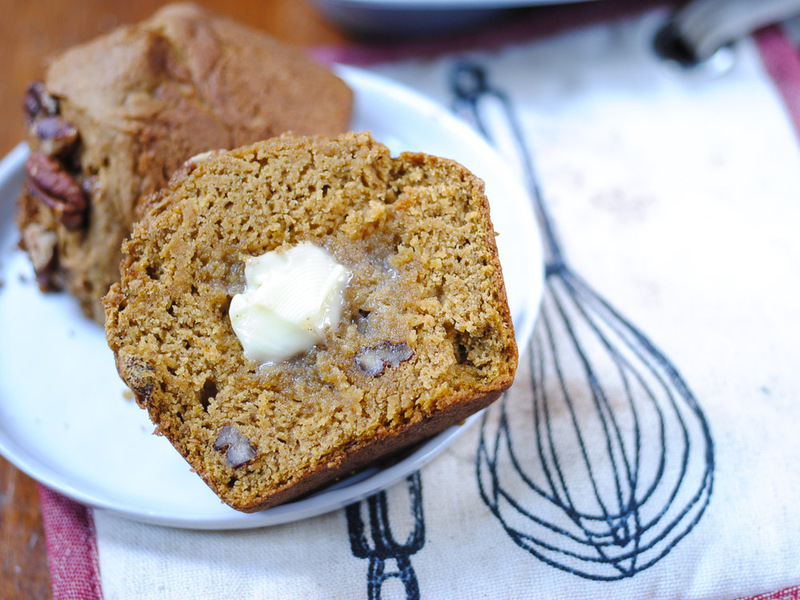 Grass-fed butter on, grass-fed butter in, happy muffins. In real life it’s a golden yellow, I’m just horrible with my light meter. I love muffins, but hate when gluten-free versions are these tiny, shriveled little things compared to the puffy, generous gluten-full options around them on bakery shelved and coffee-shop counters. So henceforth I’m using mostly this 6-cup tin and piling in my batter. 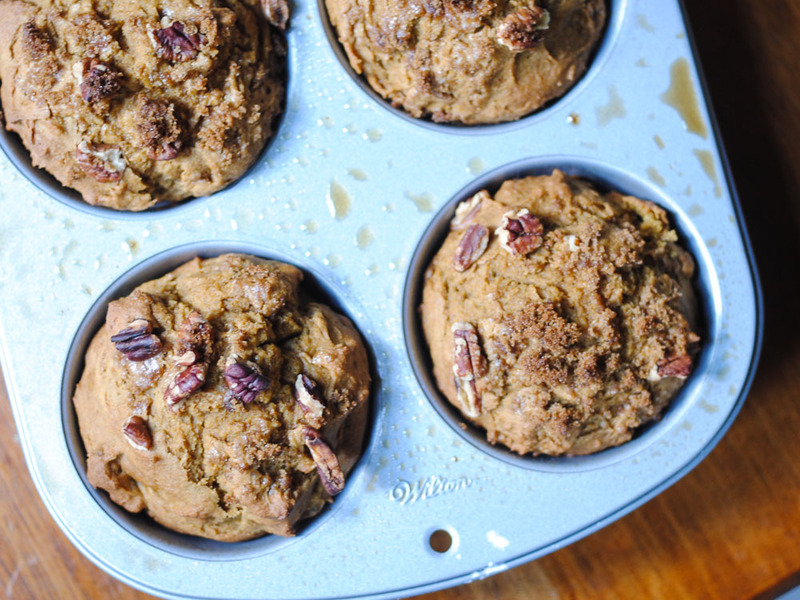 Because these muffins — fragrant and bursting with cooked-down pumpkin and cinnamon, dotted with toasted pecans and dusted with brown sugar — are just too good. They’re just-sweet enough, moist, squishy and crunchy. Served warm and topped with a smear of grass-fed butter, they’re so decadent. The kind you share with girlfriends on a road trip to Sleepy Hollow (so fun! ), or with your tiny tots, or anyone you love, or just yourself, who I hope you love, too. Let me know what you think of them, please. I cook down canned pumpkin to concentrate the flavor and take away the metallic tin from the can, a trick I learned from Cooks Illustrated and will stick by forevermore. If you don’t have millet flour (which I suggest you try, since it adds such a lovely texture and flavor to gluten-free baked goods), you can substitute with more sorghum or another mildly-flavored flour. I normally weigh my flours, but my scale’s battery is dead and I keep forgetting to get a new one! So I marked where they were poured or scooped for you. Of course you can try 2 1/4 flour of your own blend, I just can’t make any promise on the texture of the results! Preheat oven to 375d. Spray a 6 or 12-cup muffin tin lightly with cooking spray. In a large bowl, whisk together the dry ingredients up to the salt, and 1 tsp of the cinnamon. In a small saucepan, heat the pumpkin puree and the remaining teaspoon of cinnamon on medium heat, stirring constantly, for about 8 minutes. The pumpkin will steam and bubble, concentrating down to one cup. While that’s happening, add eggs to a large bowl and beat (by hand is fine) until they’re slightly thickened and creamy. Add 1 cup of brown sugar and beat until the sugar has completely dissolved and the mixture is thick and slightly puffy. When the pumpkin is down to a cup, add it, the vanilla extract and the almond milk and beat to combine. Stir in the dried ingredients, and then pour in and mix the melted butter, stirring all until just combined. Remove 2 Tbsp of the toasted pecans to a small bowl, and toss with the last tablespoon of brown sugar. Fold the rest of the pecans into the batter. Scoop equally into muffin molds, about 3/4 of the way full or more. Top with a sprinkling of the pecan/sugar mixture. Bake for 30 minutes, or until the tops aren’t jiggly and a toothpick inserted into the center comes out clean. Cool in the pan or on a cooling rack. Wrap in parchment or wax paper to store. Oh wow – those look delicious – completely delicious. Nice and autumnal. Perfectly rustic :D.
These look delicious! I’d love to wake up and have one for breakfast. Ooh, how did they come out?! My recipe actually called for FOUR large eggs (I HATE it when I type something out!). I doubt they’d fall apart with three, but I find eggs to be the clincher in gluten-free baking. Did they work with three?!? worked very well and everybody loved it. It is a great recipe. Thank you! So glad it worked with one less egg – yum!